Robert Zemeckis director of "Flight" speaks at the HBO Directors Dialogues during the 50th New York Film Festival. The 50th edition New York Film Festival had some amazing moments. One of our personal favorites had to have been the HBO directors' dialogue with Robert Zemeckis, an actual Hollywood living legend. His newest film Flight, premiering November 2nd, is promoted as a film by the same director of Forrest Gump and Cast Away; and while this is very accurate and two impressive films to boast, how can they forget about his films Back to the Future (I, II, and III), Who Framed Roger Rabbit, Romancing the Stone, and The Polar Express? Okay, I guess even I can see the problem, since I had to leave off some of my own personal favorites (What Lies Beneath, Beowulf) of his extensive and impressive list, and cannot even begin to delve into some of the incredible movies he has produced throughout the years. Basically, when a man like this decides to say something, you listen, and thanks to the NYFF and HBO we got to listen to him for an entire 75 minutes. Yeah, it was amazing. He discussed pretty much everything, from his first meeting with Steven Spielberg to Michael Douglas saving his career, the differences between old Hollywood and its current form, and of course specific details about his writing/directing process, actors he's worked with, and particulars about some of the greatest films of our generation. While we recommend listening to the entire segment (maybe with some popcorn and a notepad?) there were some moments that jumped out as pure gold for us, and we have done you the great service of highlighting those portions for you. You can thank us later. Robert Zemeckis discusses his lyrical camera movement and how far in advance he plans his shots! Robert Zemeckis talks his "wander through" with the actors and working it out together. Take a look! Director Robert Zemeckis talks the future of the mini-series and complex characters. Interesting! 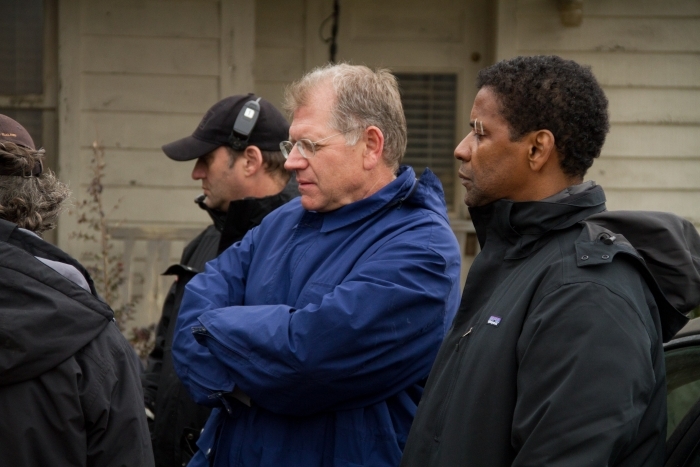 Director/writer Robert Zemeckis reveals what makes a great screenplay. And if anyone knows it's him! Does Robert Zemeckis know what actor he wants in his films when he reads the screenplay? Find out here! Robert Zemeckis talks 120 million dollar movies about nothing and why TV gets all the creative fun! Robert Zemeckis, a film-making living legend, gives his advice to young filmmakers. Take a look! If you want to direct films you have to learn to write. Robert Zemeckis said it, not us! Promise! Robert Zemeckis talks cutting edge digital future technology and what that means for future films. Robert Zemeckis gives his very candid and strong opinions on the usefulness of 3D. We have to agree! Robert Zemeckis discusses films that deeply impacted him growing up. The Blob? Really Zemeckis?